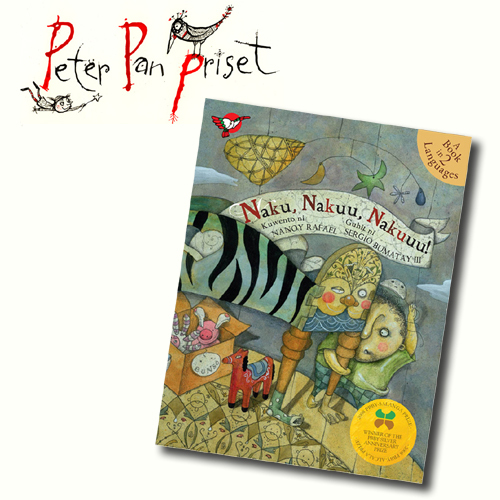 We’ve known for quite some time now, and we’re so happy to have finally received permission to announce it to the world: the International Board on Books for Young People (IBBY) Sweden has awarded this year’s Peter Pan Prize to Naku, Nakuu, Nakuuu!. Our cheers, cartwheels, and confetti to author Nanoy Rafael, illustrator Sergio Bumatay III, and publisher of the Swedish version Bokförlaget Trasten! The Filipino picture book Naku, nakuu, nakuuu! represents a part of the world not often seen in Swedish publishing for children. The theme, however, is universal: A child getting a younger sibling. The boy Isko’s anxiety about the changes he suspects will take place in his family is expressed by the recurrent cry of “Naku, nakuu, nakuuu!” (roughly “My, my, oh my!”). The illustrations mirror the main character’s apprehension, and visualize his fears in an imaginative and detailed way. Through a changing palette of colours the pictures follow Isko’s mood from anxious bewilderment to the harmonious final page: Here, the mask which Isko has worn throughout the book has been removed, and he seems to have grown into his role of soon-to-be older brother. 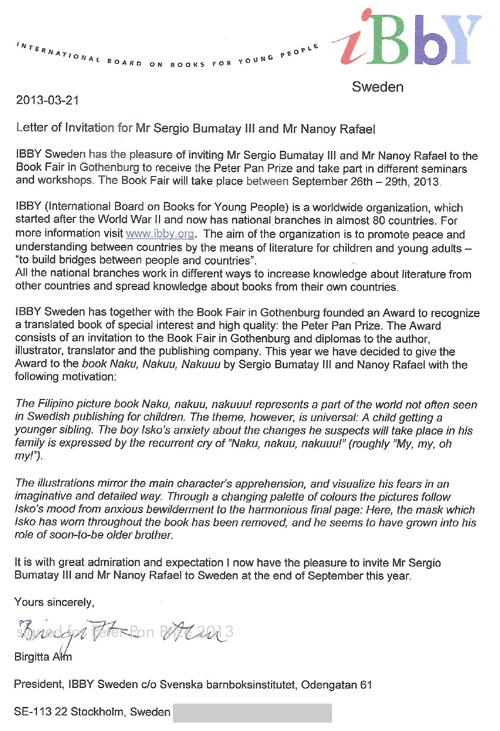 It was established in 2000 by IBBY Sweden and the Göteborg Book Fair. The prize is awarded annually to a book for children or young adults of high quality in both literary and subject terms, satisfying one or more of the following criteria: by an author previously unpublished or little known in Sweden; from a country, language group or culture with limited representation in Sweden; with content concerning children or young adults in less familiar countries and cultures less familiar to Swedish readers. This is not the first time Naku, Nakuu, Nakuuu! has won an award. 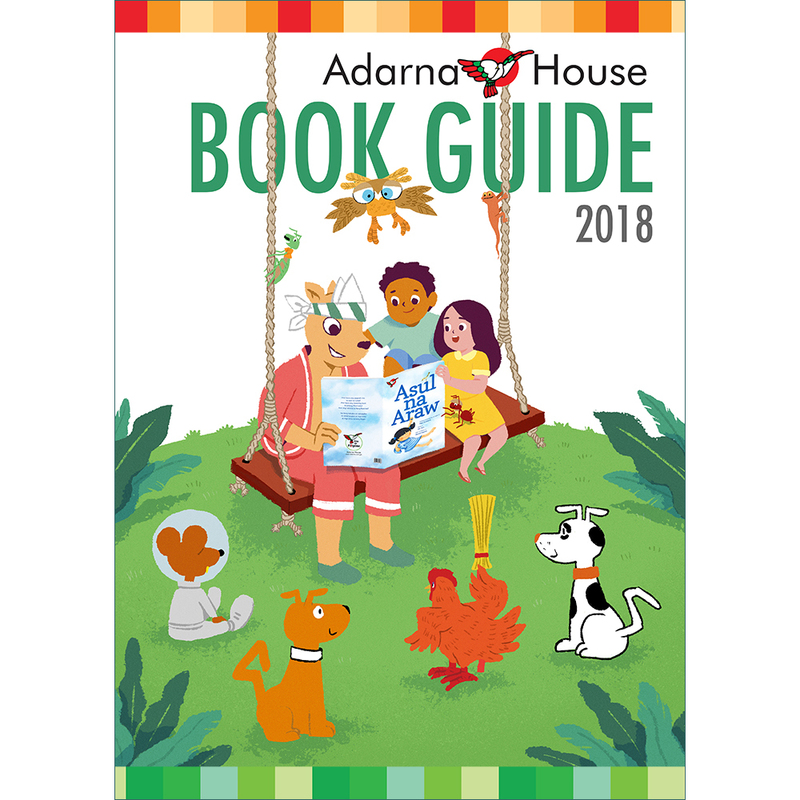 The story and illustrations won the Philippine Board on Books for Young People (PBBY) Silver Anniversary Salanga and Alcala Prizes in 2008, while the illustrations also got the Encouragement Prize for the same year’s Noma Concours for Children’s Picture Book Illustrations. Last year, it was chosen by the Metrobank Foundation’s Network of Outstanding Teachers and Educators (NOTED) to be part of the National Book Development Board’s list of Highly Recommended Supplementary Materials. The Peter Pan Prize is a great honor, putting Philippine children’s literature in the same category as last year’s winner, While We Were Out (Ho Baek Lee), and The Arrival (Shaun Tan) which won in 2011. Mabuhay ang Pinoy na panitikang pambata!